One month on each sheet, one block per day with large notes section. Keep track of important business meetings and dates with this monthly desk pad calendar. Featuring a sturdy chipboard back, one month is on each sheet, one block per day with large notes section. Yearly calendar at the bottom of each sheet. Click here to see more Calendars! 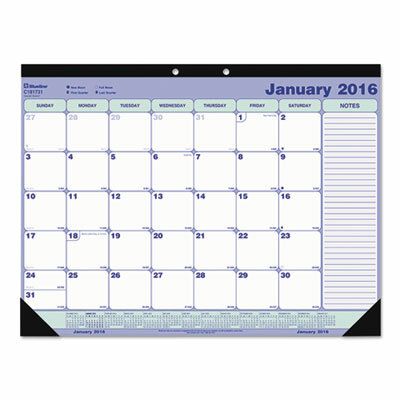 Global Product Type: Calendars and Planners-Desk Pad Width: 17"
Size: 21 1/4 x 16 Depth: 21 3/4"